Recently I found an a newspaper article that lead me to ask different questions as I research W.R. Keithley and his wife, Emma Keithley nee Weeks. On page 4 of the Butte City Daily Miner November 17, 1888 issue is an article entitled “Silver Bow’s Wealth”, and Mrs. Emma Keithley is listed with a wealth of $5,000. Assessor Holland’s book of taxable valuations in the county is listed and it represents taxpayers of Silver Bow County whose assessment runs $5,000 and upward. This information that Emma was considered among the wealth of the area made me even more curious about her and W. R. Keithley because of the number of odd events involving the two of them. Emma Scott nee Weeks married W. R. Keithley on April 16, 1888 and the marriage license indicated this was not her first marriage. At the time they married, Mr. Keithley was 62 years and Emma was about 38 years. Mr. Keithley was an attorney with a widely varied reputation that included not paying his bills. 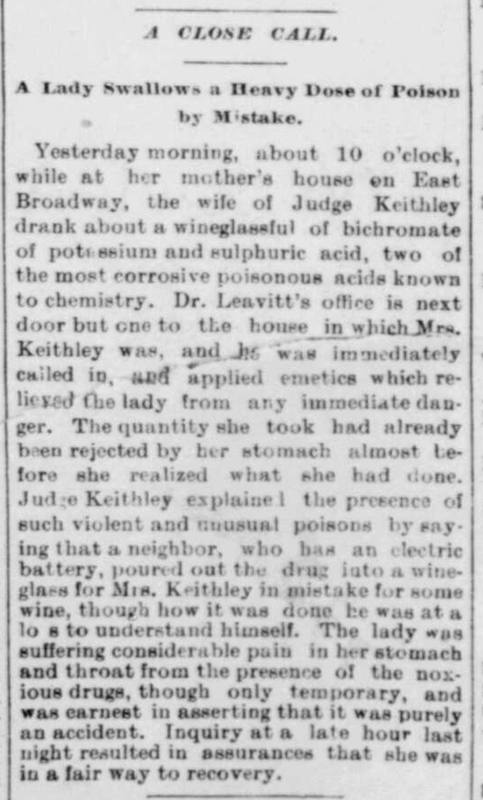 Only four months after they married, on August 30, 1888 Emma accidentally drank a wineglassful of bichromate of potassium and sulphuric acid and, thankfully, fully recovered. Then almost a year later on August 24, 1889 Emma died from an morphine overdose. From my curiosity about W. R. Keithley and Emma, I began researching for her in different ways than I had previously. My main purpose in researching her is to learn more about W. R. Keithley. So far I have learned that she was married three times: 1) Richard M. Dorsey 2) C. H. Scott 3) W. R. Keithley. Her second husband C. H. Scott had been married before and abandoned his wife moving from California to Montana where he married Emma. Who knew that the listing of Emma’s taxable valuation would spark other ways to research her and learn that about her and her previous marriages and that she has a daughter with her first husband. I am still searching and piecing together their lives so stay with me and I’ll update in the future. For now, here are some of the more detailed articles about some of the events in Emma and W. R.’s lives. W.R. Keithley was my 3rd great grandfather’s brother.